A MIXED BLESSING FOR JUSTIN TRUDEAU? The full article is available on their website here. [Ottawa – October 15, 2015] Most citizens are deeply concerned about the current status and future prospects for Canada’s public health care system. There is a clear sense that the system has eroded badly under Stephen Harper’s watch and the public are emphatically offside with many of the core health policies of the Harper government. Even within Conservative supporters, there are large levels of anxiety and dissatisfaction. In the rest of the voting population, dissatisfaction is intense – even visceral. 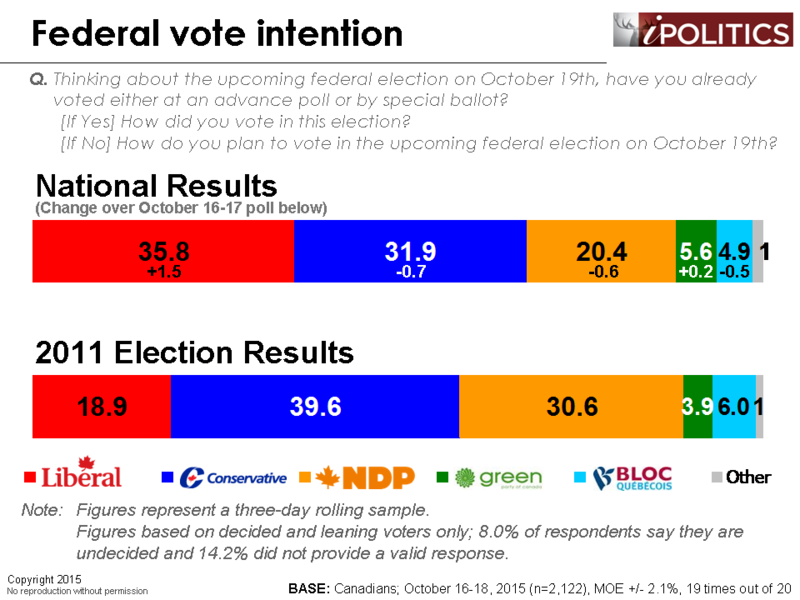 [Ottawa – October 8, 2015] The Liberals have been on a sustained rise for nearly a week and they now hold a statistically insignificant lead. At 34.1 points, the party is enjoying its highest support levels since February. The Conservatives are close behind at 32.5 points, while the NDP remains mired in the low 20s.